Your health and happiness are the only two things in life that you can (mostly) control. And without one, it’s hard to have the other. 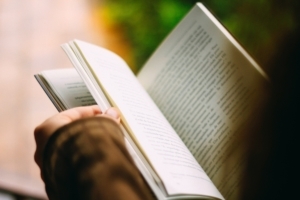 These are the best plant based books we’ve found (so far) that will help you become more informed about diet and nutrition, and how to better understand the results of scientific studies, so you can maximize both your health and your happiness. Many of the doctors and scientists who wrote these books are not vegan. They still eat honey, condone animal testing and wear animal products. They simply eat a Whole-Food Plant-Based (WFPB) diet because it is the only diet proven to be healthy for human consumption. You don’t have to go full vegan to benefit from eating a WFPB diet, minimize your carbon footprint and reduce the senseless torture of animals. A lot of people switch to this healthy way of eating, and later, when they learn about how animals are treated, start to adopt a more vegan lifestyle. These are some of the best plant based books we’ve read, with mostly unbiased science and without myths or pseudoscience to support their claims. Proteinaholic even goes into detail about how to spot bias in studies. You may also enjoy our Best Food Documentaries & Other Mind Altering Films, if you prefer watching to reading. 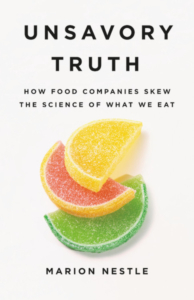 Unsavory Truth: How Food Companies Skew the Science of What We Eat – this book by Dr. Marion Nestle (no relation to the food company, not a vegan) exposes the bias and corruption in food industry sponsored research. She provides numerous well-documented examples of how corporations, industry associations, non-profit front groups, and even government agencies conspire to skew public perception by churning out bogus marketing studies under the guise of scientific research. More than 70% of all research is now sponsored by industry, leaving only 30% to be sponsored by mostly unbiased, impartial organizations. It’s a constant battle to stay relevant as a researcher, and most funding for their supplies, staff and even their own salaries must come from the grants and sponsors they attract. That means they’re far less likely to produce a study that goes against their sponsor’s best interests. This bias is manifested in the research by the type and manner of questions being asked, the research methodology design, and the spin put on the findings. Sometimes the bias is blatantly on purpose, but most of the time it’s completely subconscious. Even scientists who claim to be impartial despite their funding sources have been found to have extreme bias throughout the research process. This book confirms my belief that we should completely disregard industry funded studies unless they’re proven legitimate, because in most cases, they aren’t. Industry doesn’t spend money on anything unless there’s an expected return on investment (ROI). We shouldn’t be so naive to think they’re funding all of this research because they want to discover scientific truths. When you hear about a new study on the news or on social media, the first thing you need to do is look at both the Conflicts of Interest and the Acknowledgements sections to see who funded the study. Sometimes you can tell right away by the names in the list. Other times, you may need to look up seemingly innocent non-profits to determine who funds them. If a study is funded either directly or indirectly by corporations, either completely disregard it or dig into the study to identify if the questions being asked were unbiased and scientific, if the methodology was unbiased and complete, and if the conclusion/abstract matches the actual study findings. If you don’t have access to the whole study or time to dissect it, rely on your Credible Nutrition Sources to make sense of it for you. You may also enjoy reading my blog posts Why You Should Ignore Industry Funded Studies and Doubt Is Our Product 2.0: What Big Food Learned from Big Tobacco. 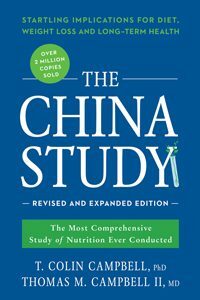 The China Study – this book, co-authored by Dr. T. Collin Campbell (raised on a dairy farm, not a vegan), is based on the longest and most comprehensive study of nutrition every conducted. It’s the culmination of decades of research on various groups of people in China compiled by thousands of researchers from Cornell University, Oxford University and The Chinese Health Ministry. Results showed a statistically significant correlation between the consumption of animal protein and the most common diseases afflicting people eating a western diet, or the diet of affluence, as the author dubbed it. The more animal protein consumed from meat, dairy and eggs, the more incidents of heart disease, diabetes, cancer and obesity were observed. 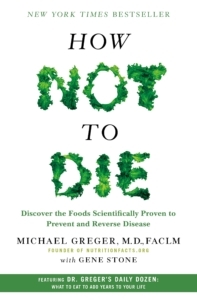 How Not To Die – this book by Dr. Michael Greger (vegan since 1994) reviews hundreds of studies that explore America’s 15 most common causes of death, such as heart disease, cancer, stroke, diabetes, obesity and others. Spoiler: Most of the diseases that kill Americans are caused by what we eat, and the best prevention and treatment is to change what we eat. Dr. Greger is a master at distilling the complicated subject of nutrition science down into easy-to-understand terminology. His team at NutritionFacts.org (a non-profit that doesn’t accept industry funding) reviews the more than 20,000 studies published each year to determine which ones can be trusted, and which ones are funded by industry sources with faulty methodologies or misleading conclusions. When Amelia and I want to know if a study can be trusted, we “Greger” it first. 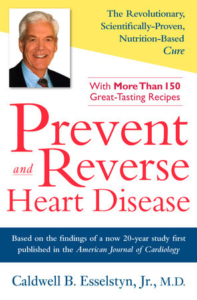 Prevent and Reverse Heart Disease – this book by Dr. Caldwell Esselstyn (not a vegan) documents his 20 year study that saved the lives of 17 heart disease patients. Most of them had undergone multiple heart surgeries and were told by their cardiologists to go home and get their affairs in order; they were not candidates for further treatment. The “walking dead” as the came to be known, were sent to Dr. Esselstyn who was conducting a study to see if a whole-food plant-based no-oil low-fat diet could prevent and even reverse advanced heart disease. “The 17 patients in the study had 49 cardiac events in the years leading up to the study, and had undergone aggressive treatment procedures. Several had multiple bypass operations. After beginning the eating plan, there were no more cardiac events in the group within a 12-year period.” They were all still alive after 20 years even though many had been given less than a year to live by their cardiologists. If you have heart disease or high cholesterol, please read this book. It could extend your life for many years while dramatically improving the quality of your life. 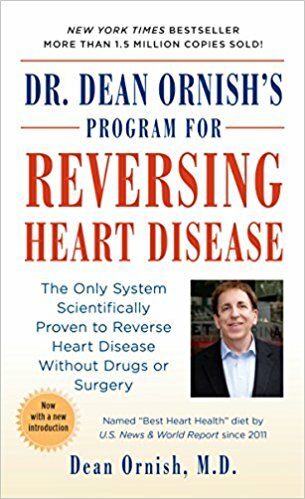 Dr. Dean Ornish’s Program for Reversing Heart Disease – by Dr. Dean Ornish is a book written about one of the first long-term studies in using diet to reverse and prevent heart disease. In the late 1970’s, Ornish became frustrated that heart disease was only being treated while virtually no effort was being put toward preventing it. Following discoveries in the 1950’s and 60’s from his predecessors like Nathan Pritikin (and others) connecting diet to heart disease, Ornish was determined to find out for certain if diet could not only prevent heart disease, but reverse it. This book covers the long-term study he conducted with heart disease patients, and effectively shows that a diet low in fat (10% of calories) can not only prevent heart disease, but reverse it in advanced heart disease patients. The Ornish Diet is a vegetarian diet, allowing egg whites and non-fat dairy, which means his subjects/patients still consumed some cholesterol and saturated fat. However, by today’s standards, it was a very low cholesterol and saturated fat diet. Exercise, stress management and smoking cessation are also components of his program to reverse heart disease; however, research conducted by Dr. Esselstyn and documented in his book (see above) show that diet alone can also reverse heart disease without including exercise or stress management. This book was originally published in 1991, with the revised version published in 1995. It’s extremely frustrating to discover that we’ve known how a truly low-fat diet can reverse heart disease for so long (even before Ornish), yet we are still debating these truths nearly 30 years later thanks to the corporate junk science funded by the animal ag industry. Millions of people have needlessly suffered and died with the cure readily available. 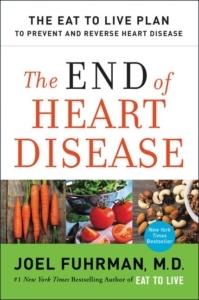 The End of Heart Disease – by Dr. Joel Fuhrman (not a vegan) shares advice based on his more than 25 years of clinical experience as a family physician. He has helped thousands of patients reverse many chronic, diet-related diseases using his Nutritarian diet-style program. Fuhrman’s diet is essentially a whole-food plant-based (WFPB) diet with a more marketable name. He encourages lots of vegetables, fruits, legumes, whole grains, nuts and seeds, while he discourages animal products and processed foods, including sugar and oil. There’s no doubt that his Nutritarian diet will reverse common diet-related diseases. It’s far better than the diet most of his patients were eating when they came to see him. However, I don’t think it’s as good as a truly WFPB No-Oil Low-Fat diet that seeks to eliminate all animal products instead of just a majority of them. He also allows a much higher fat intake than Esselstyn, Ornish and Barnard recommend. Perhaps he thinks this will appeal to a broader audience and help more people at least move the needle in the right direction, but I think some people will use his acceptance of some animal products as proof that they can be healthy in moderation. But in “The Letter of Promise” at the end of the book, he mentions that people are more successful with this diet-style when they stop consuming all addictive foods, including animal products and processed foods. Only cutting back, he says, allows those foods to continue feeding their unhealthy addictions. He seems to contradict himself. He also maligns the white potato, blaming it for heart disease due to its high glycemic index. However, none of the other plant-based doctors seem to agree with him on this. McDougall has built his practice on high starch, high glycemic foods like the white potato with similar results as Fuhrman. On this matter, they both can’t be right. Fuhrman also recommends six supplements; the most of any plant-based doctor (which you can buy on his website along with many other Fuhrman-branded products, as well as a membership to gain access to the really good stuff – I guess). Overall, this book is definitely worth reading, especially if you have heart disease and you’ve been resistant to accept the WFPB message. Fuhrman uses both legitimate science and case studies from his patients to back up his claims, but it’s far more forgiving and lenient than a truly WFPB No-Oil diet. And since he doesn’t address the environmental or animal cruelty issues with his program (two of the most important issues we’ll face in our lifetime), it will likely appeal to more people. 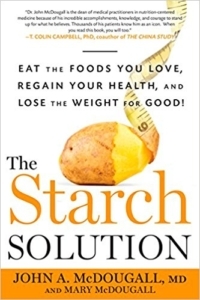 The Starch Solution – this book by Dr. John McDougall (not a vegan) documents his experience as a doctor on a Hawaiian sugar plantation providing medical care to 5,000 workers. While there, he noticed a distinct difference between the multiple generations of workers. The elder people, mostly immigrants from China, Japan, Korea, and the Philippines, were largely free of disease, living vibrant and active lives well into their 90’s. Their children were sicker and their grandchildren were sicker yet with chronic illnesses like heart disease, cancer, diabetes and obesity. The main difference between the generations was their diet. The elder generation ate food from their homeland: a largely carbohydrate based diet of rice, fruits and vegetables. The middle generation had adopted some of the western diet adding more meat, dairy and eggs. The youngest generation had fully adopted the western diet, shunning the foods from their homeland and eating a mostly meat, dairy and egg diet. They paid for that change from tradition with their health and longevity. Starch is a complex carbohydrate found in whole foods like potatoes, brown rice, broccoli and carrots. Our bodies run on these carbs as their preferred fuel source, despite the crazy, unfounded claims from the high-fat/high protein food religions. Read this book if you want to go back to eating the foods you love without the guilt created by the animal ag industry. 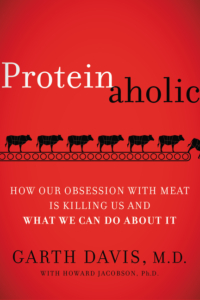 Proteinaholic – this book by Dr. Garth Davis (recovering meat-based proteinaholic turned vegan) exposes our dangerous obsession with (and addiction to) protein. He is a successful bariatric surgeon in Houston, TX, helping people shed pounds both with surgery and by transitioning to a healthy, whole-food plant-based diet. His book gives an eye-opening view into how science has been corrupted for corporate greed to create and nourish our protein obsession. He explains how to review scientific studies with a critical eye to determine their legitimacy. Every published study funded by corporations and/or industry associations “prove” their products are safe or even healthy, despite countless studies funded by independent non-profit organizations and various governments that prove the opposite. They accomplish this goal by structuring study methodologies, creatively analyzing data and/or writing misleading abstracts to yield the desired result and to create confusion where none existed. Dr. Davis explains in detail how they do it and how to know what studies you can trust. He also devotes a considerable portion of his book to debunking the high-protein/high-fat diets, exposing the carefully selected, industry funded studies and circular references they use to justify their ridiculous claims. This book provides an inoculation against corporate junk science and should be required reading for all doctors and especially heart and cancer patients. 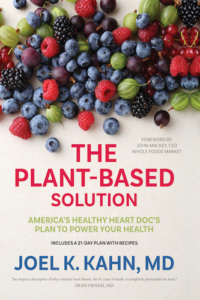 The Plant-Based Solution: America’s Healthy Heart Doc’s Plan to Power Your Health – this book by Joel K. Kahn, MD (a vegan cardiologist and restaurant owner) is a great primer to the science behind the whole-food plant-based (WFPB) diet. It’s a condensed and more accessible version of How Not To Die by Dr. Michael Greger. While I was already aware of most of the science supporting WFPB, since this book was just published earlier this year (2018), there were some studies that were new to me. Especially Dr. Dean Ornish’s new research on prostate cancer showing that a WFPB diet can reverse early stage “watch-and-wait” prostate cancer without medication, surgery or radiation. In addition to the science written in layman’s terms, the book has a 21 day meal plan with delicious recipes to help you make the transition. My only complaint about the book is the inclusion of oil in several recipes, which is surprising because Dr. Kahn wrote throughout the science section about how harmful oil is to weight gain and artery health. We haven’t cooked meals with oil (except a few decadent desserts) for almost 2 years and don’t miss it. Oil is easy to eliminate from non-dessert recipes, and even some desserts. If you’re new to this way of eating (WOE), this book is a great starting place. 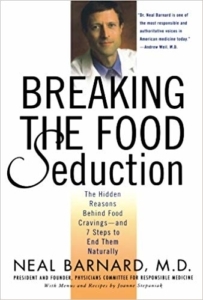 Breaking the Food Seduction – this book by Dr. Neal Barnard (raised on a North Dakota cattle ranch, vegetarian since the early 1980’s, vegan several years later) proves that there’s more to life than food. This book shows you how to break your food addictions so you can make more conscious, healthy dietary decisions and not be ruled by your tastebuds and the resulting addictive chemical reactions in your brain. His 7-step process will help you identify the motivations for your food choices, why we crave things that are unhealthy for us, and how to break the cycle so you stop craving those foods and start enjoying healthier options. Despite what the food industry will have you believe, it’s not your fault that you crave foods that are making you sick. They’ve been designed intentionally to foster addiction, but you don’t have to let Big Food win. You can stop making them rich and start making yourself healthy at the same time. 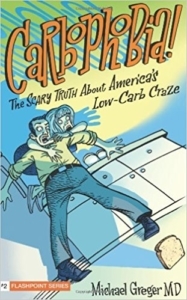 Carbophobia: The Scary Truth about America’s Low-Carb Craze – this book by Dr. Michael Greger (vegan since 1994) debunks the Atkins Diet using hundreds of non-industry funded scientific studies conducted over the past century. He also shines a light on the false and misleading claims made to support a diet that has literally killed people. If you’re considering a low-carb, high-fat/high-protein diet like Atkins, Keto or Paleo, please read this book first. 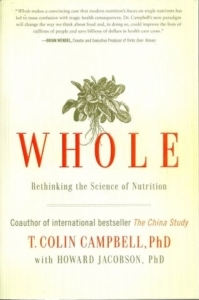 Whole: Rethinking the Science of Nutrition – this book by Dr. T. Collin Campbell (raised on a dairy farm, not a vegan) discusses how the highly complex system our bodies use to process food is far too intricate and nuanced to be understood by analyzing individual nutrients. This book challenges the reductionist science that has dominated our study of nutrition. These types of nutrition claims may sell more products to consumers who don’t understand the science, but they do very little to promote actual health in the people buying the food. Next time you have a choice, skip the apple pop tart with vitamin C, and eat an apple instead. 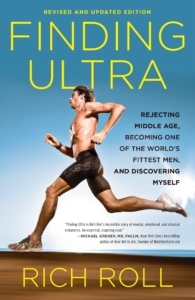 Finding Ultra – this book by Rich Roll is not only inspirational, it also shows just how far the human body can be pushed when fueled by plants. A recovering alcoholic and former competitive athlete, Rich Roll found himself barely able to make it up a flight of stairs at only 40 years old. Fearing a future plagued with heart disease and early death, he embarked on a journey of dietary and self discovery, which eventually led him to a whole-food plant-based (WFPB) diet. Fueled only by plants, Roll lost 48 pounds and had so much energy, he sought ways to use it. His book covers many of his energy outlets, including Ultraman Competitions, Ironman’s, triathlons and even his own private EPIC 5 Challenge which entailed 5 Ironman-distance triathlons on 5 Hawaiian Islands in 7 days. For those who don’t know, an Ironman-distance triathlon entails a 2.4 mile swim, 112-mile bike and 26 mile run (a marathon). He did this 5 times in 7 days all on a plant-based diet!!! I only have one complaint about the book… I can always tell when a vegan switched from paleo because they can’t seem to leave all of the paleo pseudoscience and corporate junk science behind. In this case, Roll is convinced soy and gluten are bad, while oil is a health food. If you have a soy or gluten allergy, that’s different. But we don’t tell everyone to avoid peanuts because a small percentage of the population has a peanut allergy. The legitimate, unbiased, non-industry funded science is very clear on this matter. Both soy and gluten (non-gmo) are health promoting, cancer preventing foods, while oil raises our cholesterol and damages our arteries. If it weren’t for the millions of dollars a year spent by the dairy industry to create confusion about soy and the millions of dollars a year spent by the olive oil and coconut oil industries to create confusion about oil, this debate would be over. I’m not sure why gluten is such an obsession, but I’m guessing some industry benefits from us eating less of it. Additionally, he refers to “starchy” foods as being unhealthy throughout the book, while saying how beneficial complex carbohydrates are. This shows a pretty fundamental lack of understanding about nutrition since starch and complex carbs are two different ways of saying the same thing. Sure, the food industry has figured out how to refine plants to remove the starch (similar to how sugar is a refined carb and oil is a refined fat), which they then add to processed foods, but that’s not the same thing as the starch found in potatoes or broccoli. Rather, he means “simple carbs” or “processed carbs” or “refined carbs” when he says “starchy carbs,” so make that mental translation when you read the book. If you still think starch (complex carbs) is unhealthy, please read The Starch Solution by Dr. John McDougall (reviewed above). 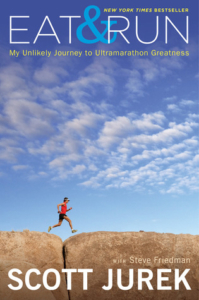 With those caveats, if you are an endurance athlete or aspire to be one, this book is a must read. It will inspire you to keep going even when you think you have nothing left. And it’ll show you how to fuel your body to give you the best chance of success…and the best chance of winning. 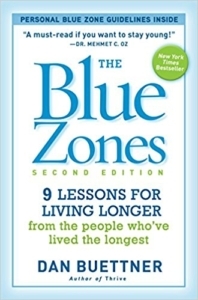 The Blue Zones, Second Edition: 9 Lessons for Living Longer From the People Who’ve Lived the Longest – this book by Dan Buettner (not remotely a vegan) looks at the lives of people who live longer than anyone else in the world. They are located in the so-called Blue Zones in Sardinia, Italy; Okinawa, Japan; Loma Linda, CA; Nicoya, Costa Rica; and Ikaria, Greece. In these areas, it’s common for people to live vibrant, healthy lives well into their 90’s and early 100’s. They aren’t laying in hospital beds, using walkers or sitting in wheelchairs, either. They’re chopping wood, gardening, walking long distances and enjoying life. Eat a healthy, plant-based diet with no processed foods and very very minimal or even better, no animal products. Get some sun every day. Find your purpose, your big “why” in life. Stay physically active throughout your life. Develop and maintain a social support network. Simplify your life. In Ecuador, they call it “tranquilo,” which means stay calm and take time to smell the roses. Overall, this book is well-written and worth reading. I enjoyed the stories of these people’s lives and the journeys the author took to meet them and document their life experiences. What an amazing adventure that must have been! 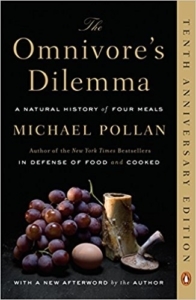 The Omnivore’s Dilemma: A Natural History of Four Meals – this book by Michael Pollan (not a vegan) provides a detailed and disturbing look into the western industrialized food system. His desire to answer the question, “Where does my food come from?” led him on a cross-country adventure: From a cornfield in Iowa, to a cattle ranch in South Dakota, to a Concentrated Animal Feeding Operation (CAFO) in Garden City, Kansas, to a “beyond organic” farm in Virginia, and more. On his adventure, he learned how our “food system” has been corrupted by government and corporate greed to provide the lowest quality, most dangerous, cheapest possible food to the unsuspecting, progressively unhealthier masses. Despite this being a non-plant-based, non-vegan book, I still think it’s worth reading to understand just how tainted the US food supply has become. In fact, a considerable amount of that food supply isn’t actually food at all! It’s petroleum, natural gas, hazardous chemicals and cannibalism (CAFO’s feed the processed remains of slaughtered animals back to the living animals to fatten them up). The state of the US food supply shows just how comprehensive and complete the takeover of America by corporations has been. Eat & Run – this book by Scott Jurek (a vegan) chronicles the author’s journey from his childhood eating lots of bacon and butter, to his transformation into an ultra-athlete powered by a plant-based, vegan diet. Jurek is a world famous Ultramarathoner with several long distance records. A typical street marathon is too easy and short for Jurek. Instead, he runs 50, 100, 135 and 150 mile ultramarathons over rough terrain, some taking more than 24 hours to complete. He even set the American record in 2010 for running the longest distance in 24 hours straight: 165.7 miles! I can’t even imagine that! I have no interest in running. I’ve never been a runner or much of an athlete, for that matter. I used to be pretty good at golf and bowled a 275 once, but sports have never been my thing. That’s not why I read this book or Rich Roll’s book, Finding Ultra (reviewed above). I read these books because I’m interested in seeing how far the human body can be pushed on a plant-based diet. The answer is: farther than people eating meat, dairy and eggs. The fact that they eat a plant-based diet and they’re elite athletes is not a coincidence. It gives them a performance advantage. They have more energy from their high-carb diets and their recovery time after training is reduced thanks to the anti-inflammatory nature of plant foods. This allows them to train more frequently with fewer rest periods of shorter duration. Without the inflammatory animal products that slow down the body and its repair mechanism, they literally have a competitive edge. That’s why they’re the best in their sports. Jurek discusses some of the science behind the plant-based diet in his book, but he still eats a lot of oil, just like Rich Roll. These guys are ultra athletes so they can get away with it (maybe), but the unbiased science is pretty clear on oil: don’t eat it. If you’re a competitive athlete, you are literally handicapping yourself by not eating a plant-based diet. If you want to improve, go vegan. It’s that simple. Don’t believe me? Read Eat & Run and Finding Ultra. If these guys can do what they do eating plants, so can you, and probably better.